The Engineering Science Class had a visit from Simpsons Project Manager, Neil Duncan, of the new museum project a few weeks ago. He came in to talk to Mr Gorman’s Engineering science classes about his job role and how the museum project is progressing. We visited the new museum site today, 4th April, to put into perspective what he had described about the project. 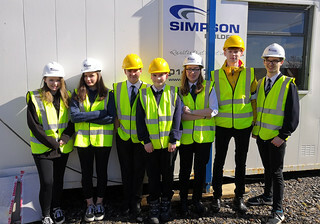 We were shown around the site by the Site Manager, Alec. He took us round the refurbished building and we were able to see the nearly complete building. We were amazed at the thickness of the original concrete walls and how long it took Simpsons to cut through them to create the new spaces and light. We learnt about the different types of engineers that were involved in the design and construction processes and the roles they played. We are looking forward to visiting the complete building when it opens in June.